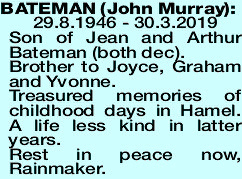 BATEMAN JOHN MURRAY 29.8.1946 - 30.3.2019 Son of Jean and Arthur Bateman (both dec). Brother to Joyce, Graham and Yvonne. Treasured memories of childhood days in Hamel. A life less kind in latter years. Rest in peace now, Rainmaker. A Private Funeral Service for the late Mr John Murray Bateman of North Perth will take place.